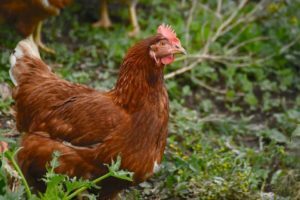 Backyard chicken coops are popping up all across the country, and people everywhere are starting the realize the benefits of having their own flock. Whether you have acres of farmland or a small space in your yard, it’s possible to raise chickens so you never have to buy eggs from the store again. But not all chicken breeds are the same. 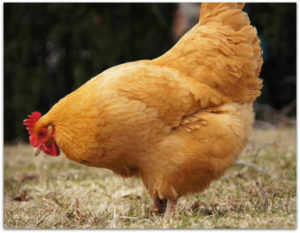 Nearly all chickens lay eggs, but the kind of chickens you own will affect how many eggs you collect and their quality. Here’s a list of the best breeds to ensure you have farm fresh eggs all year-round. This easily recognized chicken breed lays large white eggs almost every day. They’re medium birds that do best in a coop or pen, but they can also adapt to a free-range lifestyle. They tend to be nervous, and you’ll maximize your egg count by keeping them well protected in a quiet area. If you keep them fed, watered, and happy, you could be looking at over 280 eggs a year from a single chicken. These prolific birds are a farmer’s favorite, and they’re even special enough to be named the Rhode Island state bird. They’re tough chickens that live well in nearly all climates, and hobby farmers love them for their docile personalities. They’re cute and spunky, and best of all, they’re great at laying eggs. Mature females lay extra large brown eggs most days of the week. Sussex chickens are considered a dual purpose breed, meaning they’re kept for both eggs and meat. Backyard chicken owners love them for their pretty speckled feathers and curious attitudes. 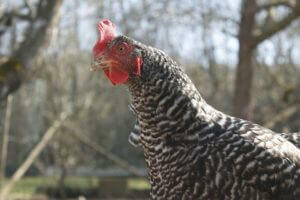 A Sussex is the kind of chicken that will follow you around the yard and work hard to be your best friend. Their eggs range from being light brown to a creamy white color, and they’ll keep on laying even in winter. These pretty chickens are a popular choice for small farms. They can be made happy living in a coop, but they prefer the freedom of free range. 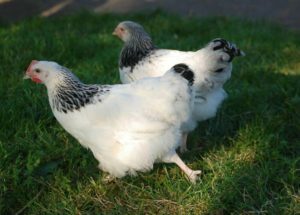 There are several different types of Plymouth Rock chickens, but the Barred and White varieties are the most common. They’re friendly toward people and lay medium-sized brown eggs about every two days. A healthy adult should lay about 200 eggs a year. Buff Orpington chickens are big and beautiful. Their fluffy-looking feathers are often found boasting blue ribbons at competitive chicken shows, and they can be kept as pets. They tend to lay less eggs during the summer, but overall, you can expect to collect about 180 eggs annually. Their thick feathers retain moisture and they don’t fly very well, so it’s best to keep them sheltered in a coop. 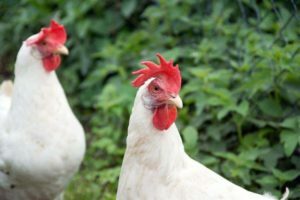 Regardless of the chicken breed you choose, the number of eggs you receive will ultimately depend on how you care for your flock. It’s important to keep your chickens well-fed with plenty of protein, and they’ll lay best when they get at least 14 hours of daylight. A chicken’s age will also affect how many eggs she lays. If you’re serious about permanently leaving eggs off your grocery list, owning chickens is the way to go. But don’t forget to do your homework. If you take care of your chickens, they’ll take care of the rest.